Polymer Building Skins. – architectkidd co. ltd. This led us to thermoplastic membranes. 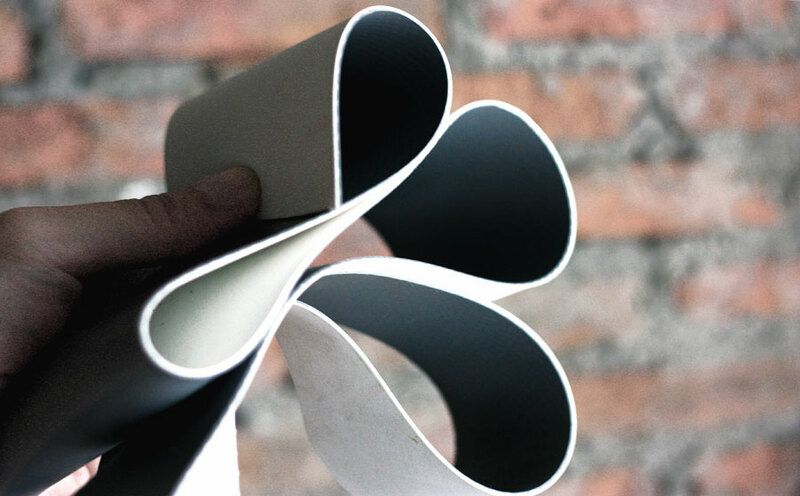 The material comes in rolls and is manufactured in continuous sheets using a process called “calendering” that allows for lamination into different layers and thicknesses. Bridgestone happens to manufacture EPDM (Ethylene Propylene Diene Monomer) and TPO (Thermoplastic Olefin) membranes for flat roof applications. We also studied PVC (Polyvinyl Chloride) membranes that could be joined by heat ‘welding’. Our initial proposal was to use the membranes to clad the entire finish of the Bridgestone Pavilion. 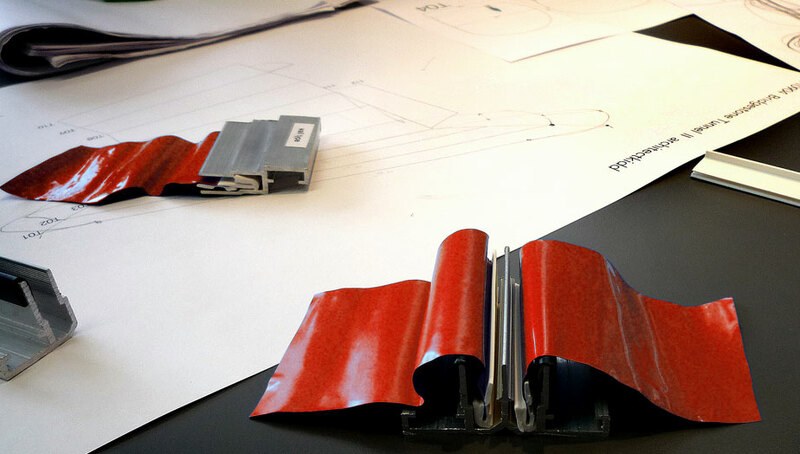 In order to test whether the membrane had the desired elasticity to be applied on top of the curved surfaces, we requested to construct full-scale mockups of the wall section. Upon reviewing full-scale mockups of our wall sections, we realized that it would not be easy to achieve a smooth and continuous finish with this material. This was primarily due to the rigidity of the membranes which were reinforced with a mesh underlay. 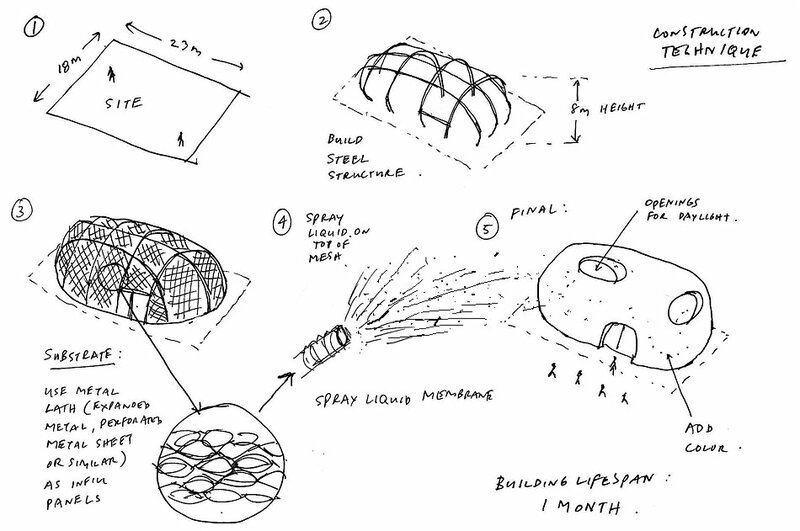 In the final construction, the TPO materials were used on the less curved surfaces such as the roof. 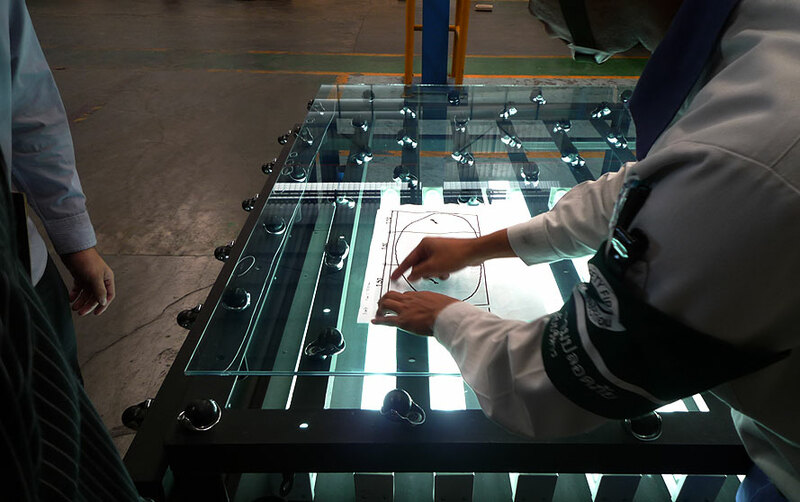 After the membrane mockups, we studied high performance, architectural elastomeric coatings. Like PU, elastomeric coatings come in liquid form. Unlike regular coatings such as paint, this coating can stretch to about 500%. 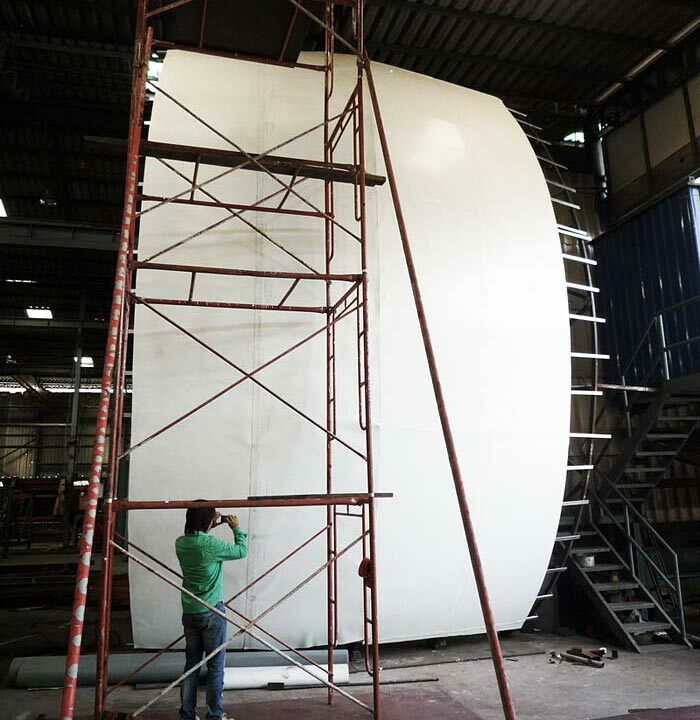 We proposed to apply the coating over the substrate (curved flexboard) by spray method to achieve a smoother finish; in the end, hand rollers were used in the final construction. 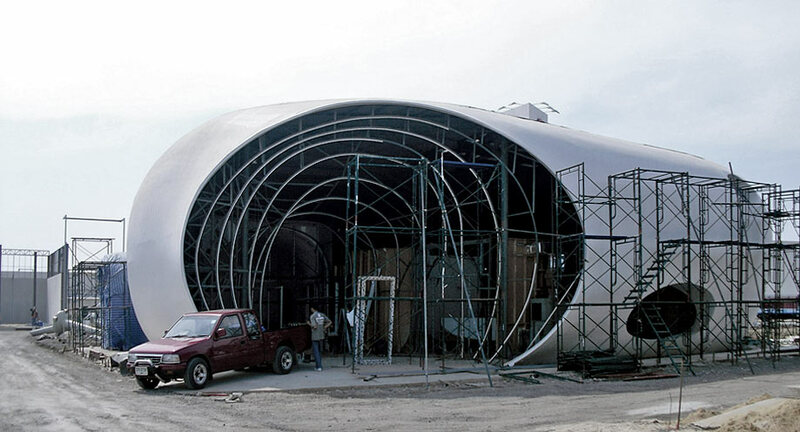 PVC sheeting is also a type of thermoplastic membrane made using the calendering process. We were looking for a high-quality finish for the entrance that visitors could experience before entering the exhibition. Unlike TPO membrane, we used PVC sheets that were thinner and designed to be stretched and framed by a proprietary support system. 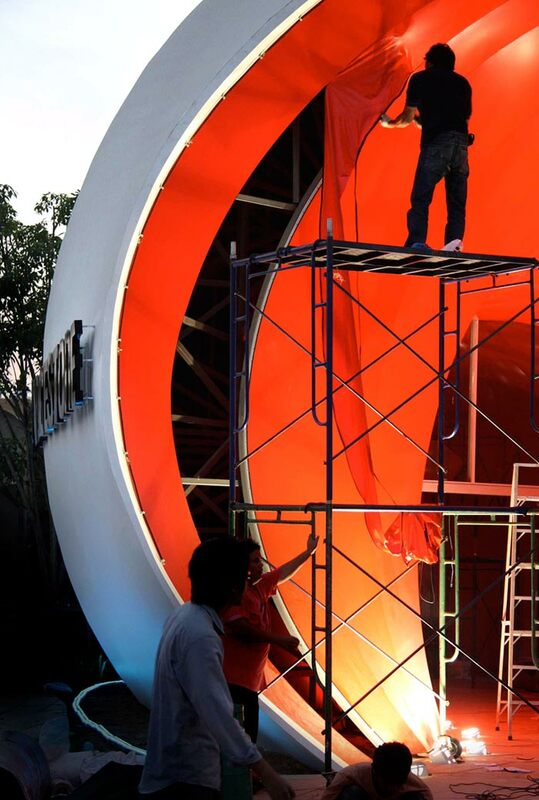 The choice of the red color was simply in reference to the Bridgestone corporate brand (along with white and black), although we hoped a broader range of color tones would be seen from the reflection of curved surfaces and lighting. Since a very precise fitting was needed, the fabrication of the PVC sheets was directly derived from ‘unfolding’ our 3D digital model. Another polymer that Bridgestone was interested in showcasing was EVA (Ethylene Vinyl Acetate), which is used as a heat-reflecting layer for glass. Since EVA is a newer laminate material technology compared to PVB (Polyvinyl Butyral), our design presented some challenges during the local production process (a more vacuum environment was required for the lamination). 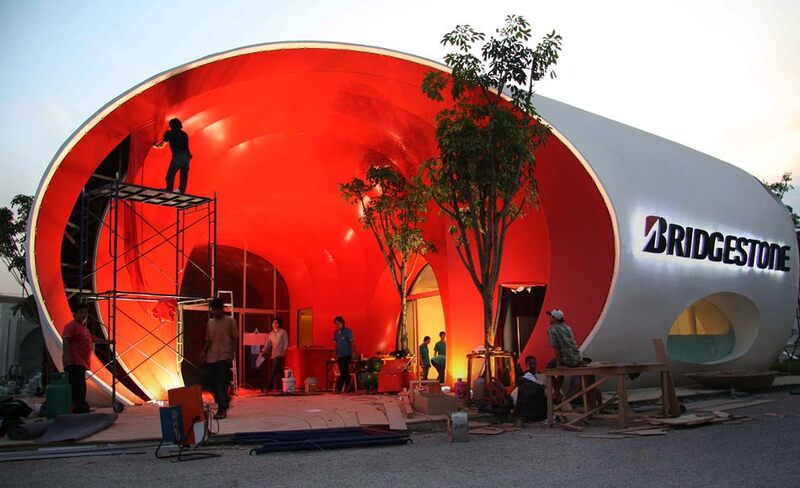 As a result, the BOI Fair is known as one of the first glass installations using EVA film in Thailand. Here is the image gallery of our construction process below. BOI Fair: Digital + Manual Construction.